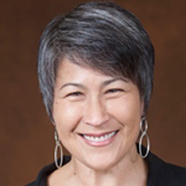 Amy Osajima is the Director of Marketing and Communications for Indiana University's Department of Theatre, Drama, and Contemporary Dance. She served as General Manager for the Newport Beach Film Festival in Newport Beach, CA for eight years, and has worked with other non-profits serving the arts, children with cancer, and the environment. She is a current board member for Bloomington Early Music and has served on the boards of The Hutchins Consort and Orange County Women's Chorus. She holds a Master of Music degree from the University of Minnesota and an MBA from the University of California, Irvine.